Cooperatives have been contributing to sustainable development and social inclusion, and have accumulated tremendous experience in this regard. At the same time, economies are still trying to recover from the global financial crisis, which has compounded previous difficulties in achieving economic growth and development as well as increasing the difficulties for the social groups left behind. This experience of cooperatives could benefit countries addressing the challenge of economic diversification. Cooperatives are in every major sector. They could be found in sectors such as the financial, agricultural, energy, fisheries, transportation, and tourism. In this regard, the experiences of cooperatives could provide important lessons to policy makers around the world as they try to diversify their economies and reduce reliance on overspecialization. This is very fundamental for sustaining growth and inclusive development. 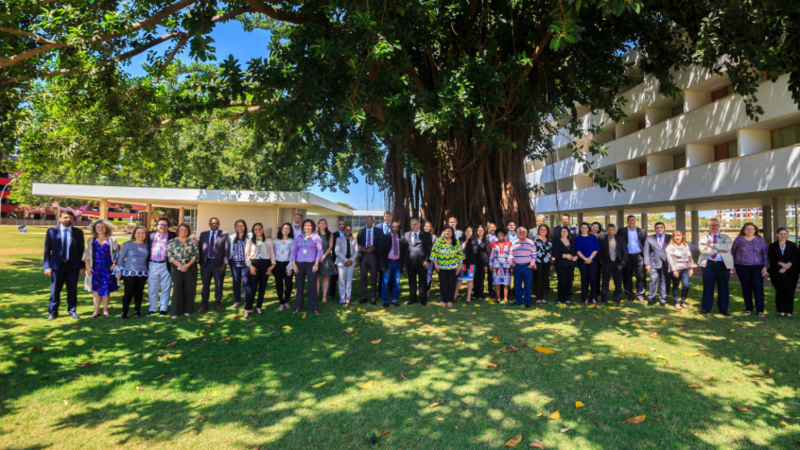 The UN Department of Economic and Social Affairs Division for Inclusive Social Development (UNDESA/DISD) in collaboration with the Minstry of Agriculture, Livestock and Supply and the organization of Brazilian Cooperatives organized a training workshop entitled ‘Cooperatives for Sustainable Development, Social Inclusion and SDGs’ from 27 to 29 August 2018, in Brasilia (Brazil). The workshop provided a forum for the exchange of experiences and substantive knowledge on cooperatives in several countries from Latina America and Africa. The aim of the workshop was to strengthen the capacity of participants to implement and review policies on cooperatives, to provide tools for leveraging the cooperative model as a viable means of sustainable living, and to provide model strategies for engaging cooperatives in addressing various social and economic challenges, within the framework of the 2030 Agenda. The event was attended by representatives of governments and also the cooperative movement of 11 countries (Angola, Argentina, Brazil, Cape Verde, Chile, Colombia, Guinea Bissau, Mozambique, Paraguay, Portugal and Uruguay), with the aim of creating a international network of cooperative leaders. The idea is that, with this network, it will be possible to find viable solutions to reach the SDGs, set out in the UN 2030 agenda. The opening of the event was attended by Niky Fabiancic, ambassador and resident coordinator of the UN System in Brazil; José Rodrigues Pinheiro Dória, National Secretary for Social Promotion, Farms and Cooperatives of MAPA; Renato Nobile, superintendent of the OCB System; Onofre Filho, director of OCB and member of the Board of Directors of the International Cooperative Alliance (ACI); and Sérgio Kelner Silveira, director of the Department of Education for Citizenship and Social Innovation of the Presidency of the Republic. During his speech at the opening of the event, UN System Coordinator in Brazil, Niky Fabiancic, said that cooperatives are synonymous with empowerment and social empowerment. For him, the cooperative movement represents the construction of a society more conscious and in tune with the sustainable development. The superintendent of the OCB System, Renato Nobile, made a point of emphasizing the importance of cooperative action, which, among its principles, has an interest in the community. “Our cooperatives are scattered throughout the country and they can show by simple attitudes that it is possible to make the world a fairer, more balanced place with better opportunities for all,” he said. Cooperativa Social Development Manager of the OCB System, Geâne Ferreira, reinforced the commitment of the movement with the people and highlighted the need for an institutional alignment for the development of initiatives capable of, in fact, changing the reality of those who live below the line of poverty. She pointed out that, since 2016, Brazilian cooperatives, through Cooperative Day, have been carrying out long-term, voluntary and transformative initiatives that are in line with the ODS. “To get an idea, last year it was possible to involve more than 1,500 cooperatives and about 121,000 volunteers in structured projects that benefited more than two million people,” he emphasized. Onofre Filho, director of OCB and a member of the Board of Directors of the International Cooperative Alliance, stressed that the cooperative movement aims, first of all, at the social well-being of cooperatives, their families and cooperative employees and that this is possible thanks to the generation of work and income, based on values ​​and principles, defined almost 200 years ago and since then, have guided the work of millions of people around the world. Sérgio Kelner Silveira, director of the Department of Education for Citizenship and Social Innovation of the Secretariat of Government of the Presidency of the Republic, stressed the need for strategic planning so that actions related to ODS are increasingly effective. Amson Sibanda of the United Nations Department of Economic and Social Affairs acknowledged the fact that cooperatives uphold principles of equality, democratic participation and social inclusion. “They are people-centered, managed by their members and committed to the communities they are in, helping to eradicate poverty and hunger, so cooperatives play a crucial role in society,” he said.